FASHIONABLE AND FUNCTIONAL – MAMAN designer bags fit all mom essentials. 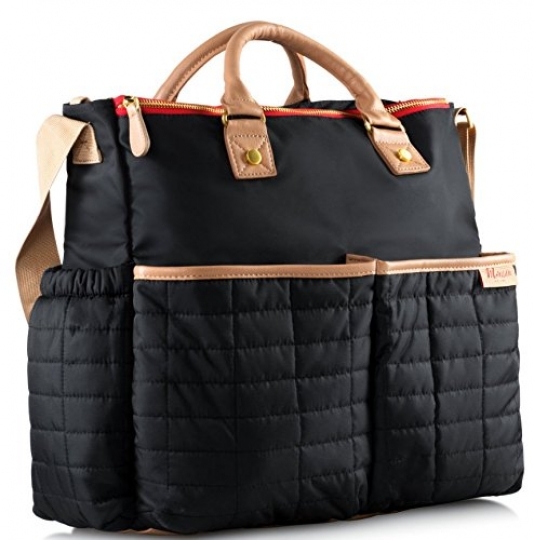 The MAMAN classic edition diaper bag has high fashion and high function ratings. Finally, a diaper bag that you'll actually look forward to carrying! WATERPROOF DURABLE MATERIAL – MAMAN exclusive wipe-clean material can handle big bottle spills & small sticky hands. High quality zippers & strong straps keeps stuff safe & secure. BY MOM FOR MOM: MAMAN bags were designed by a mom for moms. As a designer by profession and mother of 5, I know all about the “must-haves”- fashion and function. GREAT QUALITY! It's a high-end designer diaper bag – without the steep price tag. 100% MONEY BACK GUARANTEE! No risk when clicking “ADD TO CART”. Your satisfaction is guaranteed. You don't like it? You get your money back. Questions? Comments? Suggestions? We're all ears. Customer Service is our specialty. INCLUDES CHANGING PAD & STROLLER STRAPS – we are all about convenience. Our Matching changing pad is neatly stashed in back pocket. MAMAN stroller straps are universal; they clip onto every carriage. 100% MONEY BACK GAURANTEE – No questions asked! We are a small family-owned business, which means you won't be just ‘another sale'. Our customers' satisfaction is our top priority. Reach out to us anytime about anything. • Perfect baby shower gift for new mom.